Ms. Christina Howitt and Ms. Miriam Alvarado, Lecturer and Research Assistant respectively at the Chronic Disease Research Centre University of the West Indies, Cave Hill Campus, shared their new research on physical activity in Barbados at a public lecture and discussion entitled Physical Activity: Why We All Plan to Start “Tomorrow,”. 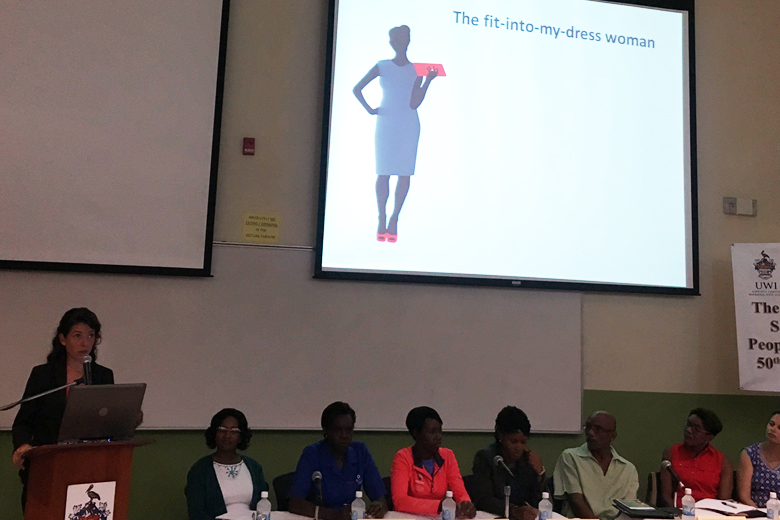 The lecture, held on July 7, 2016, was moderated by Dr. Alafia Samuels and featured a diverse panel with representatives from the Barbados Ministry o f Health, Ministry of Education, Town and Country Development Planning Office, the private sector, and HCC members, the Heart and Stroke Foundation of Barbados (HSFB). 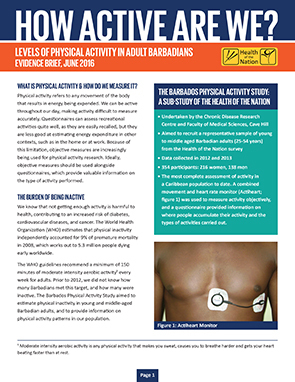 Ms. Howitt, also the local lead on the Barbados Health of the Nation Study (HoTN) launched her new evidence brief which highlighted startling findings on levels of physical activity in Barbados. Ms. Howitt discussed options to improve levels of physical activity among the Barbadian public including through the enhancement of physical spaces. You can read the complete brief here. Some of the key findings from the brief can be seen at the top of the page. The second part of the lecture featured Miriam Alvarado, Fulbright Scholar, currently pursuing her PhD studies at Cambridge University. Miriam shared her qualitative research which sought to explore why Barbadian women are not getting sufficient physical activity. Miriam’s work followed 17 diverse women and examined the motivating factors behind women’s decisions to engage in physical activity. Miriam also shared some of the successes of her Get Women Moving Campaign – a community based initiative supported in part by the HCC, which has seen over 500 women tramadol pain benefit from community exercise in just months. The panel discussion followed with strong audience interaction. CEO of the HSFB, Gina Pitts, shared the work of the organisation including their highly successful Teenage Kicks programme which engages overweight and obese children and teenagers in physical activity. Town Planning representatives were present to discuss how the physical environment is being modified to make public spaces more exercise friendly. The Ministry of Health and the Ministry of Education both discussed their related programmes. Some of the key highlights from the lecture and discussions included: recommendations for town planning to develop spaces for adult play parks; the need for educational campaigns to emphasises the short term health benefits of physical activity; the need to communicate the cognitive benefits of exercise to parents; school PE programmes need to focus on the physical literacy of all students vs. the development of a select small subset of ‘athletes’ and PE benefits should be included in medical school training including specific requirements. The HCC applauds the Faculty of Medical Sciences on this excellent lecture and congratulates the speakers and the panel on their research. Perhaps one audience member summed it up best when he commented that he was truly inspired by the evening. 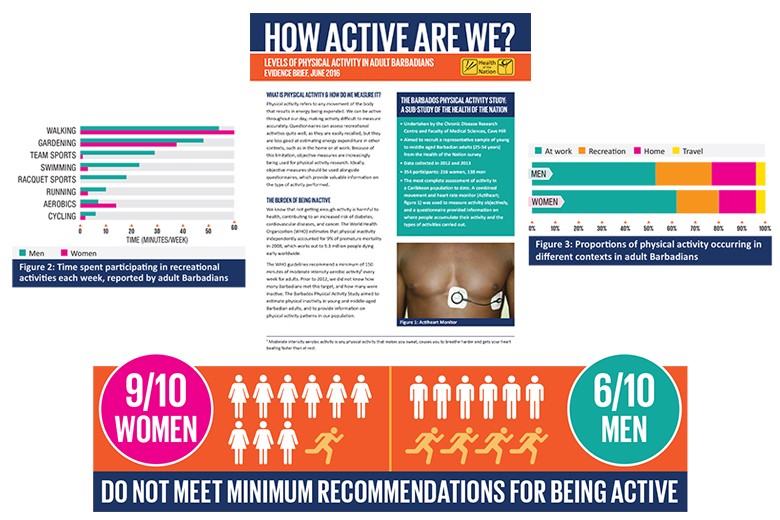 The HCC commits to working with the HCC to disseminating this data both nationally and regionally in support of stimulating a wider conversation about changing policy as it relates to creating supportive environments for improved physical activity. See also the strong advocacy work of the HFJ in Jamaica working to push mandatory physical education in schools.